The Pancake. Light, fluffy, buttered-up and drenched in fake maple syrup. Breakfast of champions. Quintessentially American. Or are they? Archaeological evidence suggests that pancakes in some form are probably the one of the earliest and most widespread cereal-based foods eaten in prehistoric societies. There you have it, straight from Wikipedia, which is always correct. 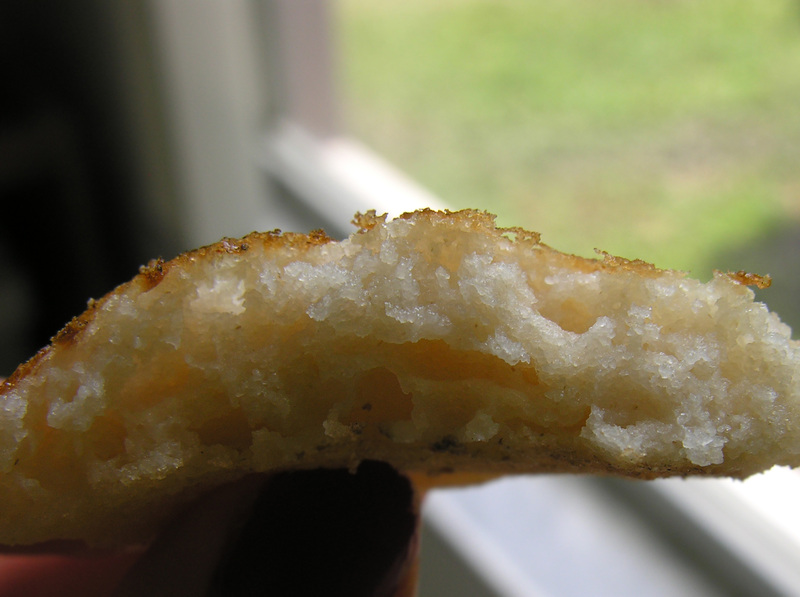 Everyone has forever loved these fried circles of batter. Slightly sweet, savory, filled, or topped with so much whipped cream, fruit goo and/or cream cheese schmutz that you feel your blood sugar rise just watching the commercial for the latest craze at a pancakery near you. Bacon is served on the side, and very necessary, it seems to shock the body out of its sweet coma before it’s too late. I can tell you who the people are who do not enjoy these ancient, beloved, and widespread joy-giving cakes of the pan. 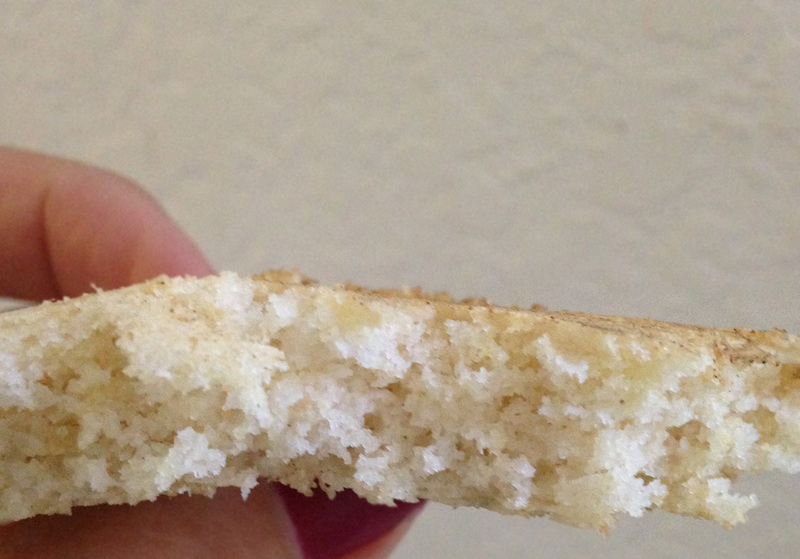 The people who avoid gluten like – well, like gluten. Most gluten-free pancakes either taste ancient, or taste like gummy/glue/ goopy/gunk. Not very charming. Step into my Doctor Who TARDIS, shout Allons-y and go back in time with me just about 9 years. My son, had just been diagnosed with PDD-NOS. PDD-NOS stands for Pervasive Development Disorder Not Otherwise Specified. In plain English – your child doesn’t have enough checked boxes on the autism checklist to be diagnosed with it, and isn’t an Asperger’s diagnosis, but he is quirky and socially awkward so we’ll give him this non-descriptive label. Think Brick, the beloved character from t.v.’s, The Middle, but more so. Anywhoo, we had just decided to take the gluten-free leap that has been so helpful for kids on the autism spectrum. What does he want for breakfast? Pancakes. Pancakes! YES! I have a mix for that! Pancakes coming up in 10 minutes! YAY! Pancakes! They worked, they look good! But, before giving any to him, I try them myself. I am going to try everything he eats to make sure it’s tasty. That’s what a good mom does. Sure the first ingredients were garbanzo and fava bean flour, but there were surely enough other ingredients in there to make it taste good, right? Ok, think fast. Hungry child needs pancakes and mommy told him there would be pancakes and I need to get them to him now. So, I smiled and said “Yum, lets put some syrup on these!”. Lots of syrup. He and his sister ate them up. Now, my daughter, then almost 7 wasn’t gluten-free yet, so she just was being polite I’m guessing. But drenched in syrup, almost anything is good-ish. I threw out the mix and tried more mixes, but eventually I just came up with my own recipe based on the good-old red Better Homes and Gardens/Betty Crocker Cookbooks from the 60’s. Remember my term, vintage food? There were a few mini-failures until I tinkered with the right ingredients, but it worked. We never threw out a batch, we just syruped them up! my son had pancakes. Get back into the TARDIS with me, fast-forward, and here we are 9 years later, and my kids eat pancakes in many different forms. 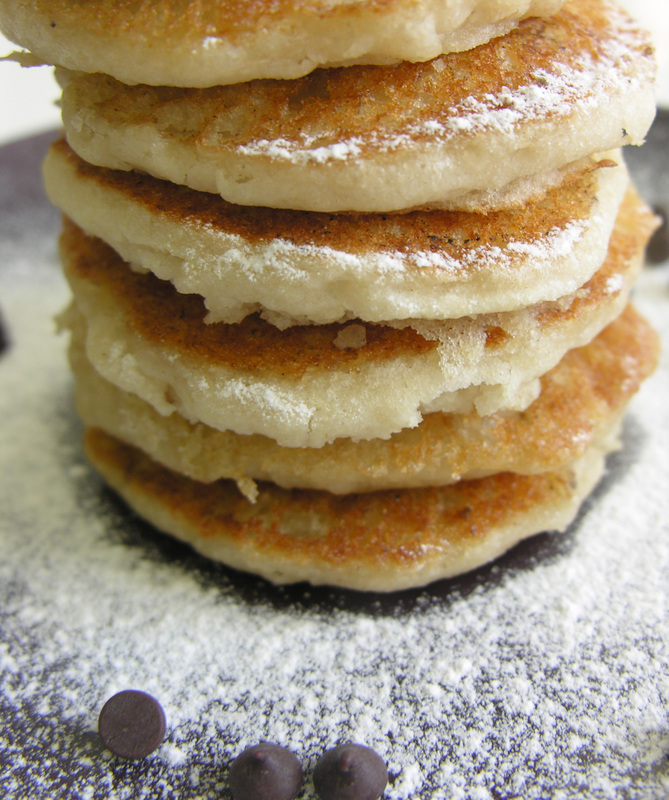 Pancakes from nut butters, coconut flour, paleo ingredients, ground nuts, oats, and now this grain-based egg-free recipe. Now, I’m not so full-of-myself to suggest that I have perfected a gluten-free pancake. BUT…… I am slightly pretentious and kind of enamored with myself, so I will kind of hint that I created a good, solid recipe. Think sweet-tasting goodness almost reminiscent of a cake doughnut but with a pancake texture. I miss cake donuts……Think moist, flavorful round little cakes of happiness. Think holds-butter-in-the-little-nooks-on-top-but-doesn’t-dissolve-when-syrup-is-poured-on-it. At least I don’t think it does. These honestly almost didn’t make it through the pictures, my kids assistants were slightly more demanding vocal that I take my pictures quickly for this post. Think still good after being microwaved to reheat. Think good cold. That’s right. Cold. Like at midnight when one is trying to get a blog post out for the next morning and can’t have the microwave going off. Did I mention they are egg-free? Did I mention they passed the chief taste-tester’s taste, texture and palatability test? He approves. Odd little pancakes, aren’t they? Not very pretty. Think Little House On The Prairie’s Ma making griddlecakes. I cook all of our food in cast-iron pans. We don’t use any non-stick or aluminum pans, so our food looks “rustic”. Real rustic. Shabby Chic, if you will. But, if you cook with a non-stick pan and make these, please comment on this post and let me know how it turns out! Makes: about 8-10 pancakes, depending on the size of spoon you use. These work very well in smaller sizes. Oil for greasing your pan, if needed. Butter would taste divine! Preheat your pan/griddle to just below medium, these tend to cook fast and burn even faster. If you are using a cast-iron skillet, LIBERALLY oil your pan. And then oil it again. Mix all of your dry ingredients together. Once your pan is heated, add the wet ingredients and stir thoroughly and quickly. The batter will start to thicken and rise immediately. Ladle small spoonfuls onto your pan, about a little larger than silver-dollar pancakes. This will make them easier to flip. When the top of each pancake top has lost it’s shine and there are tiny bubbles trying to work their way up and out of the pancakes, it is time to flip them. There are no eggs in this recipe, so you don’t have to worry about them being underdone. (Note: if you are using a cast-iron pan, be prepared to work at getting your spatula under the pancakes. Be patient and kind to them, it will happen. I recommend an offset spatula for this) Cook on the reverse side for about 1 minute, and remove to a plate. If your remaining batter has risen too much during this time, add the tablespoon of milk and stir. Continue making pancakes! Instead of applesauce, add 3 tablespoons of gluten-free oat flour into your dry mix. Prepare recipe as above. A helpful hint from Heloise: Don’t have any oat flour? Do you have oats and a coffee grinder? Then you have oat flour. Place about 1/4 cup of rolled oats in your dusted-out coffee grinder – don’t worry, your oats won’t taste like coffee and your coffee wont taste like oats – and grind steadily for 20-30 seconds. Voila! Oat flour. No trip to the store for exotic, expensive ingredients needed. Unless you don’t have oats in your house, then, well……I hope the store isn’t too far away. Because you need to make these. Another note: these will be super fluffy, but also on the more delicate side. If you are topping them with butter, be sure it is slightly softened first before trying to spread it on the pancakes.They taste fantastic! Did I mention how fluffy these are? So, there you have it. Pancakes. 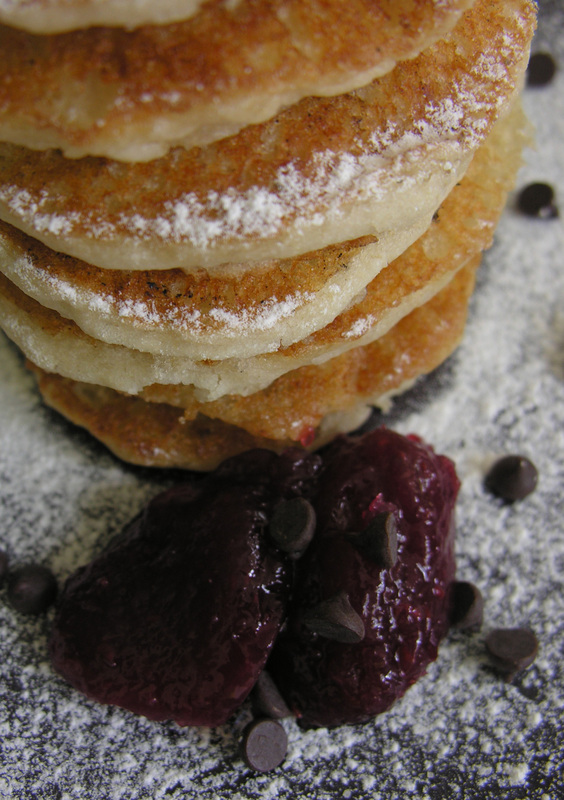 Easy, yummy pancakes. 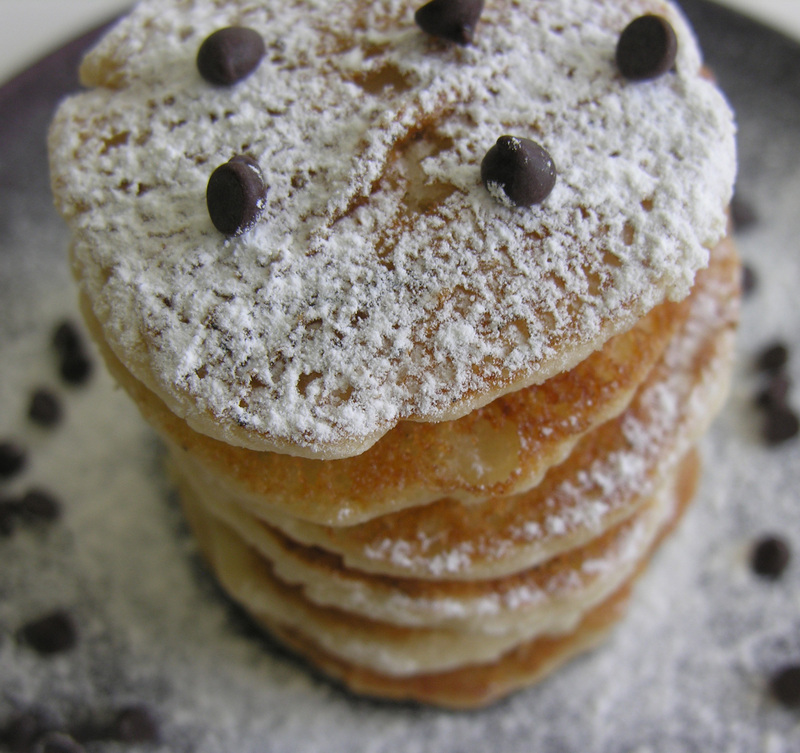 Serve them with butter, syrup, butter and syrup, allergen-free chocolate chips, or raspberry jam and homemade powdered sugar.